THE ABOVE-GROUND POOL WITH THE IN-GROUND ATTITUDE. Can be installed above ground, semi-inground on a slope, into a hill or inground. Learn More about our Metric Pools. HALFWAY IN AND ALL DECKED OUT. Beautiful and classic geometric shaped pool. 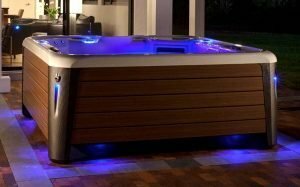 With this semi-inground pool, you can a add full deck and railing system. Various sizes and install options to comply with many HOAs. Learn More about our Grecian Pools.